This weekend, the Outside Lands Music Festival will mark its 11th year with an impressive lineup of performers including Janet Jackson and The Weeknd, myriad food and drink options from top Bay Area eateries and breweries, and, for the first time ever at a major U.S. music festival, cannabis. (Well, sort of.) Debuting at the festival this year will be Grass Lands, a "curated cannabis experience" centered on educating adults aged 21 and older about weed while also recognizing Northern California's contribution to the state's new recreational market. "Much the way that Wine Lands celebrates Napa and Sonoma as the leaders in U.S. wine production, Grass Lands will shine a light on the area's importance as pioneers in the cannabis world," the organizers detailed in the official event announcement. The Bay Area has long been host to cannabis happenings — from 4/20 at Hippie Hill and industry conferences like New West to the NorCal Cannabis Cup and countless weed-centered parties and fundraisers — but Grass Lands is blazing a new trail as part of a large-scale, high-profile mainstream festival. So will other festivals follow suit? "Festivals in general — like Lightning in a Bottle, Burning Man, Coachella, Bonnaroo — should all be doing this," said Luna Stower, California state marketing and events director for Jetty Extracts, an Oakland-based cannabis brand participating in Grass Lands. "I've attended every Outside Lands for the last six years, so this was a very personal thing to me as a Bay Area resident and lover of music. It's an excellent blend between our lifestyle brand and the San Francisco music festival scene — it's culture-building, it's educational, and it's a really good alignment." Plus Products CEO Jake Heimark agrees. "The market for cannabis-based products has entered a long-term growth cycle," he said. "There will definitely be many more events across the country as consumers become more comfortable with cannabis use." Music festivals are big business. According to Pollstar, Coachella was 2017's top earner, selling 250,000 tickets and grossing $114.5 million over two weekends. Outside Lands reportedly took second place, at $27.9 million over one weekend. Last year, Coachella increased the visibility of brands looking to interact with consumers, with corporate sponsorships like free wifi hosted by Netflix and HP's virtual reality lounge providing the types of experiences that the millennial audience craves. For brands in the nascent legal cannabis industry, which has to contend with eradicating decades of misinformation and stigma, being able to come face-to-face with consumers outside of a dispensary environment demonstrates remarkable progress. "2018 is a historic year for California's cannabis industry," said Heimark. "Having a presence at Grass Land is important to building public trust and paving the way to industry normalization." 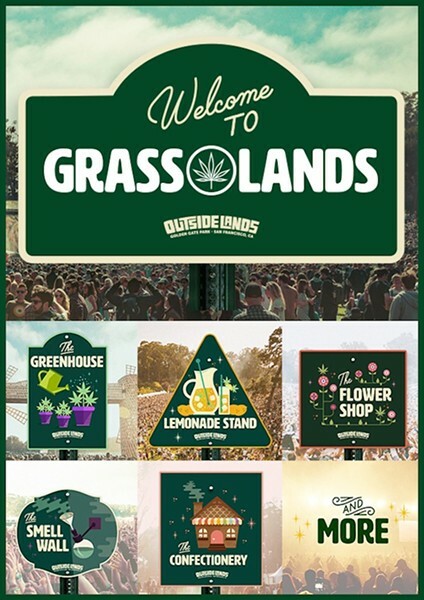 Visitors to Grass Lands can look forward to "hands-on education around cannabis through a multi-sensory experience," according Rick Farman, co-founder of Superfly, which co-produces Outside Lands with Another Planet Entertainment. Set up as a Town Square located South of the Polo Field (aka SoPo), the space is set up for attendees to "walk through and visit various shops, each focused on something different," Farman said. Learn all about cannabis from knowledgeable budtenders in The Greenhouse, explore botanical terpenes at the interactive Smell Wall, shop at a weed-themed Farmers Market, and satisfy your munchies at The Confectionary. "The focus for us, when conceptualizing what we wanted for Grass Lands, was for it to be a first-­of­-its-­kind educational and creative experience for Outside Lands festival goers," Farman explained. However, the one weed experience that guests at Grass Lands won't be having is actually getting high. Sales and consumption of cannabis products are not allowed at the festival, and should you end up craving a pre-roll after learning about the terpene myrcene, feel free to have it delivered ... to your home, because no deliveries can be made within Golden Gate Park. Currently in California, temporary cannabis events with on-site consumption and sales are only allowed at county fairgrounds or district agricultural association properties. (Although local jurisdictions have the power to deny the permits, which happened earlier this year with the High Times Cannabis Cup in San Bernardino. The Chalice Festival is suing the Bureau of Cannabis Control over the same issue.) But proposed legislation, AB 2020, would allow the state's Bureau of Cannabis Control to authorize temporary event licenses for a cannabis event at any other venue approved by the local jurisdiction. To the cannabis companies involved in Grass Lands, however, the focus is less on the absence of sales and consumption and more on using their products to educate and inform consumers about cannabis. "Jetty Extracts is proud to be working alongside [vaporizer brand] PAX doing custom engravings of Era devices with the Outside Lands logo," Stower said, adding that, "people can meet with a Harvest budtender who can talk more about products and give them in-depth understanding about how to medicate." Heimark is also looking at the bigger picture. "Our mission is to make cannabis safe and approachable for all types of consumers," he said. "We are excited to introduce more people to a true California brand."